Best for all Studentssubmitted by Eric E. - Feb 25, 2017 |Recommended: YesThe management is so helpful and nice. They really help you feel at home and secure. It's nice when your landlord has everyone's best interests in mind and not just their own. It's great living at Capri. response from property - Feb 26, 2017 Thank You Eric, We strive our hardest to make your stay with us the best Isla Vista has to offer. We are here for you when you need us! Well maintained, staff friendly and reliable.submitted by Nicole C. - Feb 01, 2017 |Recommended: YesThe staff here are lovely, very reliable and approachable. They are able to lend you things left over from residents past if you're in need - which we have found absolutely amazing. The maintenance is quick, and things are fixed properly. The wifi has just been adapted for the better, and runs much more smoothly now then it did before. There's a few warnings. The walls are pretty thin, and you can here your neighbours pretty well - especially if they're playing music. If the music is at night, the bass can be felt through the floors. earplugs are advised for those moments, especially during midterms and finals it can be quite annoying Also the front and back gates are usually propped open, and not locked, makes it easier to enter but unsafe for your belongings. I would recommend insurance just to be on the safe side. Other than that, the common area is well maintained, looked after, and mostly tidy. Trash is taken away at regular intervals. The laundry room has 2 washers, and 2 dryers, both of which are usually working. It isn't too costly at 3 for wash and dry. The location is perfect. It is 5 minute walk from UCSB campus, 15 from UCSB RecCen gym . Overall, it has everything I need in the unit - including a flatscreen TV, two bathroom sinks, a washing machine, and microwave. It's a lovely place to live. response from property - Feb 02, 2017 Hi Nicole! 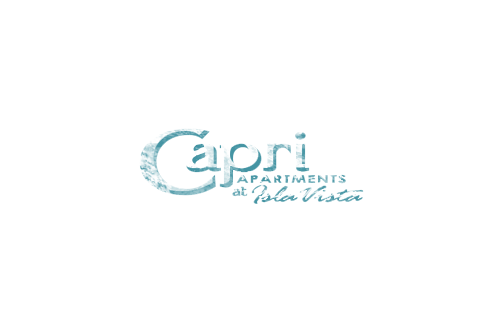 We are lucky to have you here at the Capri! I really like living at this property.submitted by Vivek P. - Aug 07, 2016 |Recommended: YesThe management is a lot better than most places in IV and any work orders are done really quickly. response from property - Aug 08, 2016 Hi Vivek! We love having you at the Capri! response from property - Jun 15, 2016 We are so thankful for you and who you are! We are glad we could be of assistance to you in your time here at UCSB. Thanks for being our friend in the office! response from property - Jun 16, 2015 Thank You Kisung, We love this place and look forward to helping you as much as we possibly can!